As I go about setting up for freelance work as an indexer, all sorts of things keep popping up that I realize I haven’t considered yet in terms of consequences to my work. This whole chain of thought started when I saw a post on CINDEX users list about the incident of the cat on the keyboard. I realized this was something that could happen to anyone with a cat in the house. 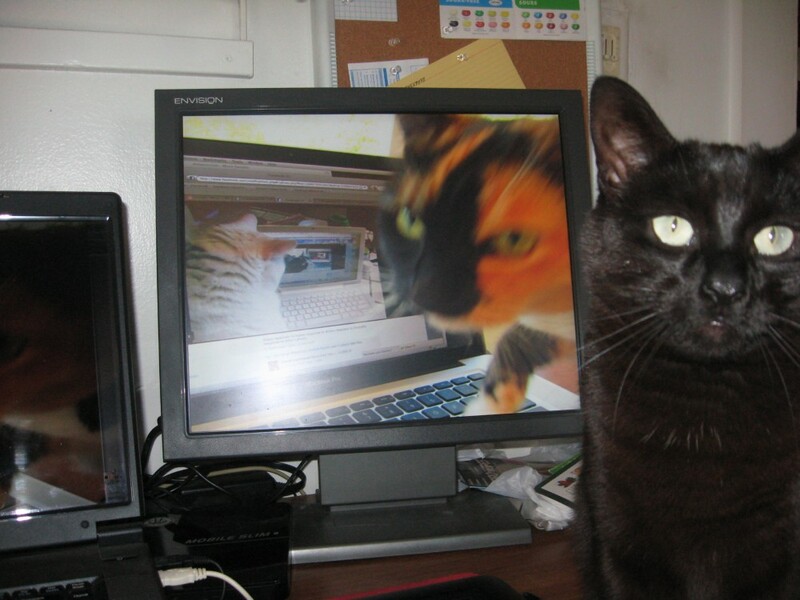 I do have a cat in the house–and I have had cat on keyboard (not with the current cat–yet), but nothing really serious resulted then–I just had to undo a “hung up” computer. Now, my cat does not seem prone to walk on the keyboard–she walks carefully along the edge of the laptop keyboard, but sometimes steps on the touch-pad, briefly. Not likely to be a problem, right? Then, I watch her go berserk chasing a bug that’s flying around the room and I realize that I probably should consider the possibility of cat-on-keyboard as a workplace issue since it’s not possible to exclude the cat from the office. I vaguely remember seeing “anti-cat-on-keyboard” software somewhere a number of years ago (while working as a telecommuter with a very frisky cat in the house). Unfortunately, that software was incompatible with proprietary software that I needed so I didn’t keep a link. But there’s always Google. While I was searching for this software, Trillian popped a Tweet onto my desktop from James A. Lamb about working on multiple machines and avoiding UPS. Since the UPS was an issue that I’ve been thinking about, I followed the short link to his blog article. What caught my eye was his reference to off-again, on-again power problems–not frequent where I live, but it does happen. After reading that article I browsed a bit more and found another recent post on “Assessing Risk”. Had I though about doing this as I’m setting up a freelance business? Not really. As a telecommuter these issues were taken care of for me. Now I realize that is no longer the case–I have to deal with these issues myself. Yes, I have an external hard drive for backup and I have an online backup (Carbonite), but reading the article on risk assessment has made me actually think about what my backup systems are really doing…what would happen with the cat-on-keyboard scenario? If my work is being constantly backed up, will I lose my backup if the cat hops on the keyboard and destroys my work? Will the modified file be backed up? Will it overwrite the last save? I need to know more about the parameters of my backup systems…continuous background backup sounds good, but is it really? It occurs to me that I might want to take a proactive approach where it’s easily done–so back to checking out the anti-cat software. Back to Google…searching for anti-cat-on-keyboard brings up PawSense, and BabyShield (for PC users) and CatNip (for Macs). Now, for some more risk assessment now that I’m aware of the need for it! Maybe even assigning some numbers….